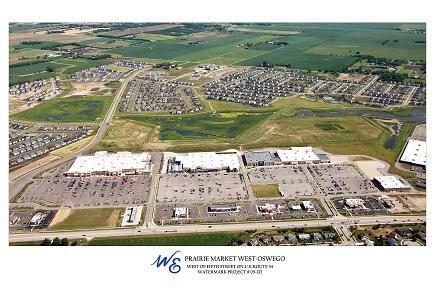 Projects by Watermark Engineering Resources, Ltd.
Prairie Market Retail Center is a 151 acre retail (118 acres) and residential (33 acres) development that was transformed from a cornfield to a major retail center for the region. Significant IDOT permitting was necessary for roadway improvements (3 major full access points) and traffic signals (3). Stormwater storage was handled by a regional stormwater management facility owned and maintained by the Park District. Watermark Engineering Resources, Ltd. was the lead consultant coordinating the land development related issues and consulted the client through all aspects of the project from annexation to Oswego, Illinois to as-builts. 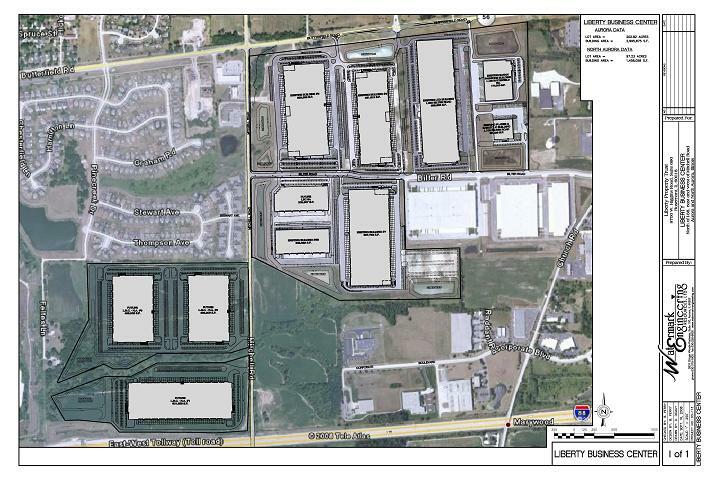 The Liberty Business Center is a 300 acre industrial development located in Aurora and North Aurora, Illinois. Watermark was retained to work with the developer, architect, landscape architect, soil and water conservation district and both municipalities to develop a strategic plan to annex the properties into two different municipalities and provide a sustainable land plan and final development plans for the proposed development. Throughout this project, Watermark has been responsible for the design of the mass grading including storm water detention for the entire park, design of the extension of Bilter Road, design of the widening of Mitchell Road, design of turn lanes on Butterfield Road (IL Route 56), design of the site improvements for approximately 4,453,933 s.f. of industrial buildings and coordination with subconsultants to obtain all of the site related permits including wetland permits from both Kane County and the US Army Corps of Engineers. Watermark utilized the available resources to develop a plan which would work with the existing features of the land which included an unnamed tributary to the Fox River and numerous wetland areas that were regulated by both Kane County and the US Army Corps of Engineers. This project started in 2003 and phases of the project are still continuing today. Watermark has been consulted through all phases to implement a successful project while maintaining the integrity of the existing features of the land. Currently we are in the final phases of obtaining LEED Gold certification on a 698,000 s.f. building and have worked with the developer to ensure that future buildings will be able to go for LEED certification. Watermark has been proud to work on this very successful industrial park in Kane County, Illinois, which incorporated many aspects of the land development process. 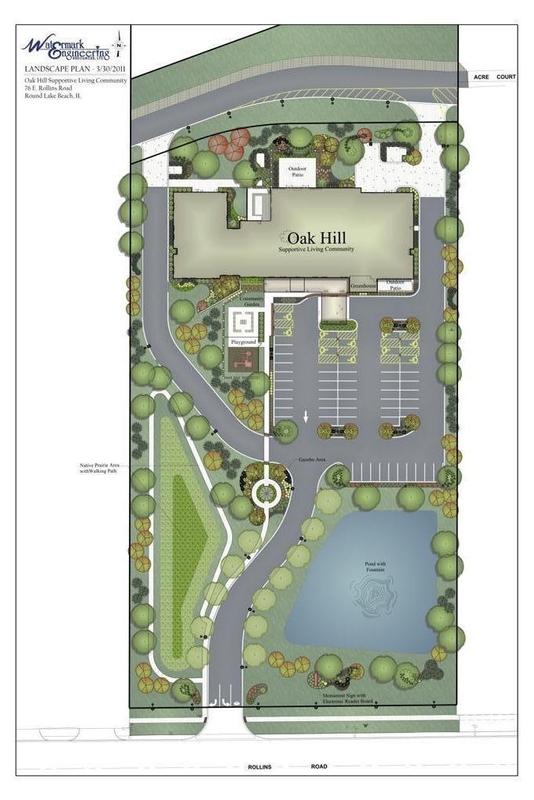 Oak Hill Supportive Living Community is a 94 unit Senior Living Community in Round Lake Beach Illinois. Watermark worked with the developer on this project from initial due diligence through construction. Development of the 10 acre parcel required coordination and approval from many different agencies including: Lake County SMC, Lake County DOT, Village of Round Lake Beach, the US Army Corps of Engineers, various sanitary districts, and the IEPA. Utilizing Best Management Practices (BMPs), stormwater storage was provided in both a wet retention basin and a native vegetation basin before traveling to the downstream storm sewers. Watermark had an instrumental role in the design of all aspects of this land development project including the civil engineering design, landscape design, site lighting design, permitting through the various agencies, performing the SWPPP inspections during construction, and acting as the Lake County DOT Resident Engineer (RE) for all improvements within the Lake County right-of-way.